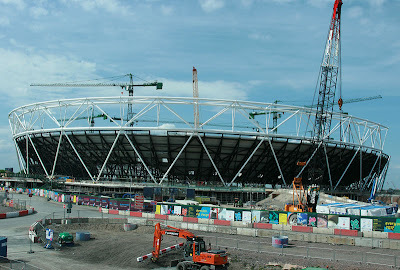 A glimpse at the 2012 Olympic games site. The new stadium is well underway. Lots still to do but they're working everyday. lovely we are in the same boat in SA at the moment. Preparing for 2010 Soccer World cup and a lot of stadiums are being built. The UFO has landed to London. I think it looks amazing! I'm so excited for London. Where in London is this being built? Yes, where is this in London?? So looking forward to seeing the next Olympic in London. Please keep us updated on the new contruction. Thank you, Mo. Will be fun to see this work in progress, a preview of the stadium. I'm surprised at how quickly its coming together, especially here in the UK! Keep us posted. I bet Londoners are already sick and tired of the Olympics! It's nice to have a pre-Olympic glimpse!!! How exciting for London.